Since 2012 I have spent my Christmases with my partners family in Lapland, Finland. During this festive period it is traditional for a relative or friend of the family to play Santa and deliver the presents to the unsuspecting little kids. Wanting to keep Christmas alive for the children I have never volunteered for this role, nor have I ever been asked. One cold Christmas Eve after my partner's brother had finished playing Santa I decided to borrow his costume and head out into the woods to take this portrait. As I stand alone I am reminded of my position through the exclusion of a moment one that forces me to reflect on notions of race and representation within western culture. The resulting image was used to make a festive postcard. 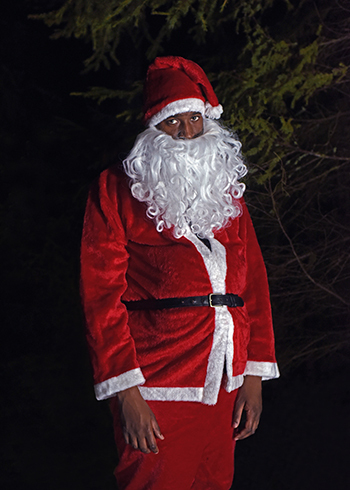 Its distribution offers an alternative representation to the stereotypical depictions of Santa Claus. Depending on region this card may not be suitable for children under 8 years old.